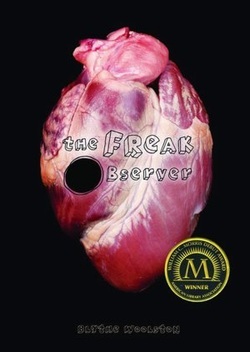 The Freak Observer is about death, life, astrophysics, and finding beauty in chaos. For eight years, Loa Sollilja's world ran like one of those mechanical models of the solar system, with her baby sister, Asta, as the sun. Asta suffered from a genetic disorder that left her a permanent infant, and caring for her was Loa's life. Everything spun neatly and regularly as the whole family orbited around Asta. But now Asta's dead, and 16-year-old Loa's clockwork galaxy has collapsed. As Loa spins off on her own, her mind ambushes her with vivid nightmares and sadistic flashbacks—a textbook case of PTSD. But there are no textbook fixes for Loa's short-circuiting brain. She must find her own way to pry her world from the clutches of death. Winner of the William C. Morris YA Debut Award, 2011. "Bones don’t last forever in the woods. Coyotes scatter them around. Mice and other little animals gnaw on them. They get chalky and start to fall apart. Bones don’t last forever. But The Bony Guy does."